Downwinders at Risk and over 60 other local, state and national groups filed a petition Tuesday urging the U.S. Environmental Protection Agency (EPA) to protect public health by setting pollution limits on oil and gas wells and associated equipment in population centers around the U.S. Led by the public interest law organization Earthjustice, the nationwide alliance also includes The Clean Air Council, Clean Air Taskforce, Environmental Defense Fund, Global Community Monitor, Natural Resources Defense Council, Physicians for Social Responsibility-Los Angeles, Sierra Club, and WildEarth Guardians. Making the case to require oil and gas companies to limit toxic air pollution from oil and gas wells in urban, suburban and other populated areas as the Clean Air Act expressly provides, the petition urges the EPA to act quickly to protect public health. “More than 150 million Americans now live near oil and gas wells or above shale areas where companies are looking to drill or engage in hydraulic fracturing, and EPA needs to set standards that restrict the hazardous air pollutants they put into the air,” said Earthjustice attorney Emma Cheuse, who filed the petition on behalf of the groups. 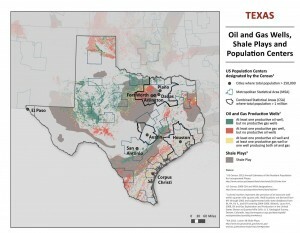 A significant number of those millions are Texans, who are hosting at least four large gas and oil plays in the state, including the Barnett Shale that overlaps large sections of the DFW metropolitan area. "Almost a decade of un-and-under-regulated fracking has transformed North Texas into a sacrifice zone for the gas industry, with conservative estimates of over 1,000 tons of hazardous air pollution being released annually from industry sources. Breathing this toxic air pollution has left a well-documented trail of illness and disease throughout the Barnett Shale. EPA needs to do its job and protect frontline victims of fracking by reducing the toxic fallout from the practice," said Downwinders at Risk Director Jim Schermbeck. Besides the DFW Metropolitan area, Houston, Austin, San Antonio, Corpus Christi, Beaumont-Port Arthur, Waxo, Lubbock, Amarillo, Laredo, College Station-Bryan, Killeen-Temple-Fort Hood, McAllen-Edinburg-Mission, Longview, Tyler, Abilene, Wichita Falls, Odessa, Midland, Sherman-Denison, Victoria, San Angelo, and Texarkana would also be protected by the new regulations. Facilities presently not regulated for their toxic air pollution that would be covered under the petition include new and existing oil and gas wells, existing hydraulically fractured gas wells (unless modified), new hydraulically fractured gas wells that are exempted, most equipment associated with wells, including: many storage vessels, pneumatic controllers, compressors, and equipment leaks. Next post: Have You Seen This Bucket of Hazardous Waste ?